Arches National Park, located off Highway 191, five miles North of Moab, Utah, With more than 2,000 arches has the greatest density of natural arches in the world. National Park offers mute testimony to the forces of wind and water erosion. 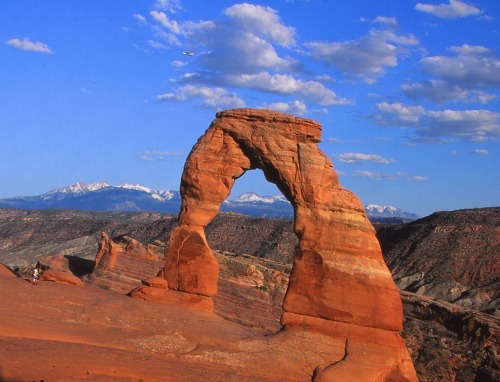 The park is home to Delicate Arch, one of the most photographed arch in the park and the one displayed on Utah’s license plates. Arches National Park is located off Highway 191, five miles North of Moab, Utah. Moab has an airport located 16 miles from downtown Moab. The service provider is Great Lakes Airlines. They have daily scheduled service to Denver, CO and Vernal, UT. Grand Junction Regional Airport - Grand Junction, Colorado (GJT) and Salt Lake City International Airport - Salt Lake City, Utah (SLC) are the nearest airports serviced by the major airline carriers. There is no rail service into Moab. Books and Maps about Arches National Park may be purchased at the Visitor Center, or you may purchase them through Amazon.com by clicking the link below. 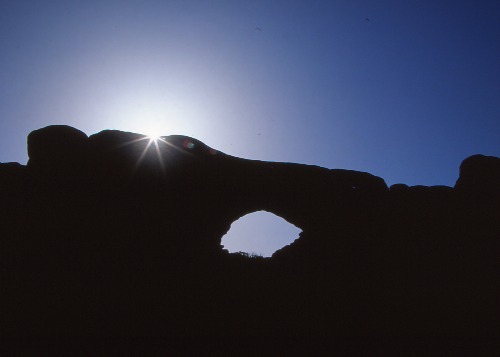 Arches National Park is open 24 hours a day, every day of the year. • Open daily 9:00 a.m. to 4:00 p.m.
• Open extended hours spring through fall. Applies to motorcycles, bicycles and walk-ins (per person). Good for entrance to Arches, Canyonlands National Park, Hovenweep National Monument and Natural Bridges National Monument. 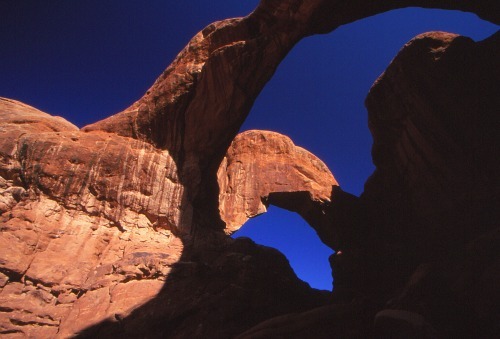 • All federal lands passes are issued and accepted at Arches. For a map of Arches National Park, Click Here. Arches National Park is located within the Colorado Plateau, a “high desert” region, and is subject to wide temperature fluctuations. The most popular times to visit the park are during the spring and fall when daytime highs average 60 to 80 F and lows average 30 to 50 F.
Summer temperatures often exceed 100 F.
Winters can be cold with high temperatures averaging 30 to 50 F and lows averaging 0 to 20 F.
Except in the nearby mountains, snowfall is light. To find Temperatures and Precipitation by month, Click Here. For Current Weather in Moab, Click Here. In 2010, for the first time in the park’s history, visitation reached one million visitors during one year. Unfortunately, the infrastructure at the park is not equipped to handle such numbers. 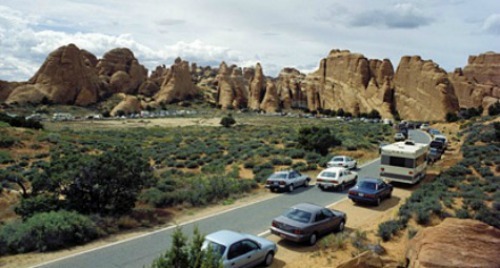 The roads are narrow and the parking is limited at all destinations, especially at such popular trailheads as Delicate Arch and Devils Garden which may fill for hours at a time, especially on weekends and holidays. It is commonplace to find the parking lots full anytime between 10 a.m. and 4 p.m. from March through October. You can avoid some of the crowds by arriving at the park before 8 A.M., although even then you will encounter photographers who are out early to capture the sweet light. It is difficult to see, but just to the left of the clouds above the arch is a small white airplane. To avoid the masses of adoring visitors to Arches National Park, the best time to visit is generally anytime between November and May. “February is an awesome time to visit the park, if you can handle the cold temperatures. There are absolutely NO crowds – not even tour buses. July through August are especially busy times of the year even though the temperatures are exceedingly high. There is no lodging within Arches National Park. 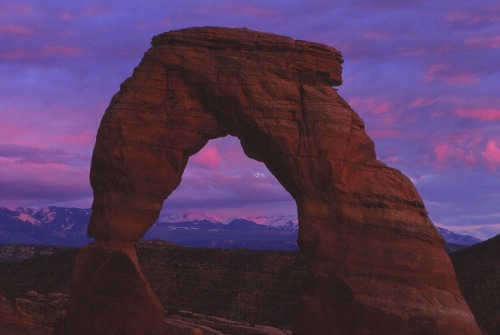 The nearest lodging is in Moab, Utah located 5 miles south of the park. To find lodging in Moab, use the Search Box to the right. 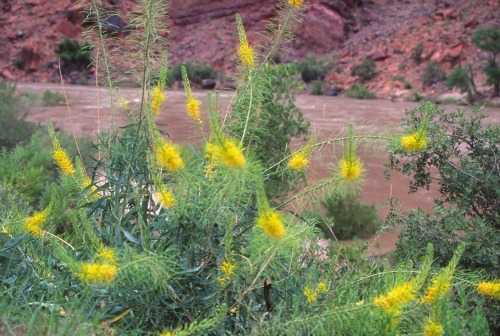 • Located eighteen miles from the park entrance Open year-round. • Sites will accommodate up to ten people. There are no showers or RV dump/fill stations. Some sites will accommodate RVs up to 30 feet in length. Bring your own wood or charcoal for the grills. All reservations must be made through www.recreation.gov or by calling (877) 444-6777, (877) 833-6777 (TDD), or (518) 885-3639. • All sites may be reserved for nights between March 1st and October 31st. • Reservations must be made no less than four days and no more than 180 days in advance. • There is an additional $9 booking fee for reservations. For more information about the Campground and Reservations, Click Here. 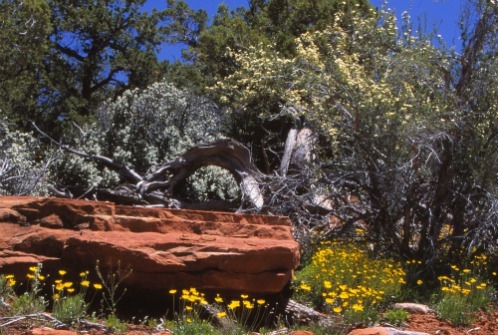 For the many visitors who are limited on time or who prefer to remain close to their vehicles, the 18-mile scenic drive through The Devil's Garden and the Windows Section of the park offers them an opportunity to see some of the outstanding features of the park. For more information on Auto Touring, Click Here. 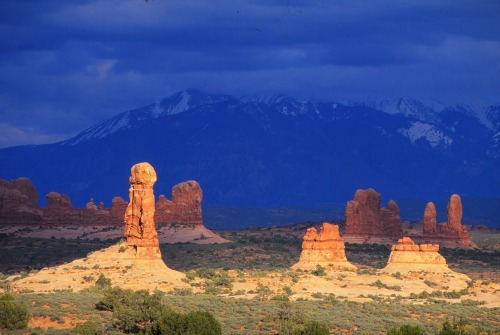 • Arches National Park is a relatively small park with few undeveloped areas suitable for backpacking. • Free backpacking permits are required for overnight backcountry travel. • Permits may not be reserved in advance. • Permits may not be picked up within one hour of sunset to allow time for reaching and establishing a campsite. To download a Backpacking Brochure, Click Here. Bicycles are permitted on all paved and unpaved roadways within the park but not on any of the trails. Within the park, there are no bike lanes, and riders are required to ride single file with the flow of traffic. Outside of the park, there are ample opportunities for biking. There are trails of every difficulty level, from dirt roads to technical single-track. 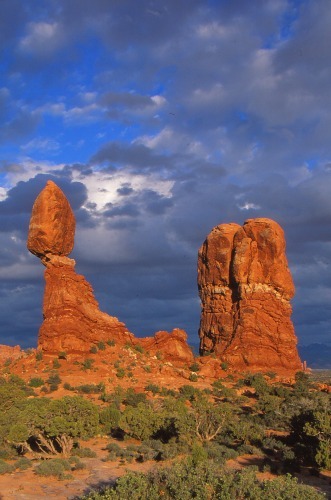 Hiking in Arches National Park is a great way to explore the park and see the arches from a different perspective. There are hikes for everyone: easy, moderate and difficult. These hikes range from 0.3 miles round trip to 1.6 miles and take from 15 to 60 minutes to complete. These hikes range from 2.0 miles round trip to 3.4 miles and take from 60 minutes to 3 hours to complete. These hikes range from 3.0 miles round trip to 7.2 miles and take from 2 to 5 hours to complete. “There are no marked trails to the Fiery Furnace and the area has suffered resource damage due to increased visitation. 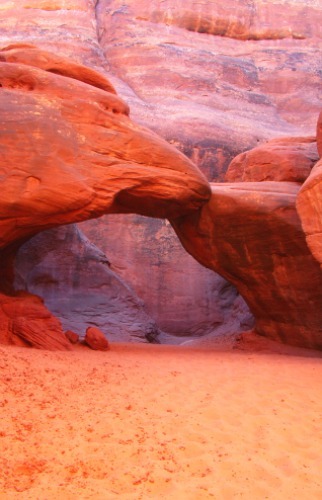 Hikers who want to explore the Fiery Furnace are encouraged to sign up for a ranger-guided hike. 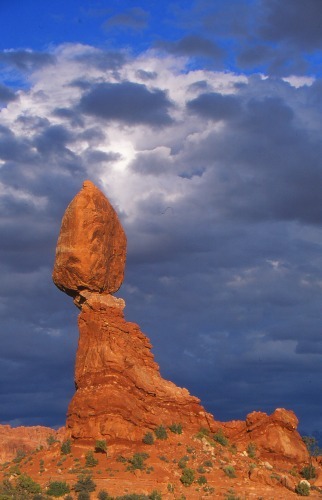 Arches National Park abounds with great photographic subjects. And while the subject plays an important role in making a great image, it is not necessarily the most important role. A great subject in unflattering light generally makes for an unflattering photograph. But, that same subject shot in the golden light of early morning and late afternoon seems to glow from within; it takes on a life of its own. Even an unflattering subject can look great in the right light! So make it a point, when possible, to do your shooting early in the morning and late in the afternoon. Remember, too, that some subjects photograph better in the mornings as opposed to the afternoons. To help you plan your shooting schedule, the Arches National Park service has published a list of arches and the suggested best time for filming them. To see that list, Click Here. Some of the most dramatic photographs I have ever seen were made when the weather was stormy. Storm clouds billowing in the sky, jagged bolts of lightning streaking toward the ground, a double rainbow arcing through the heavens and who could ever forget the horror of a tornado racing across the landscape. Storms make for dramatic photographs, but don’t place your life in danger trying to capture them. Be aware of their potential for dramatic images as well as their potential for doing you harm. 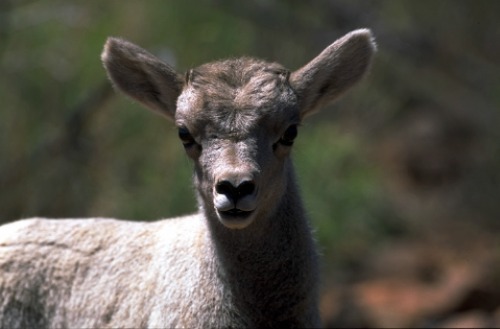 Almost 50 species of mammal are known to live in Arches National Park. 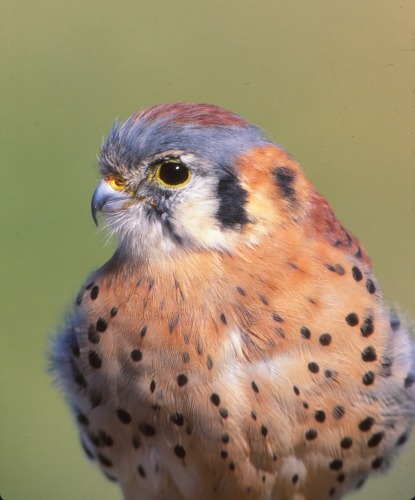 273 species have been seen in the park, including seasonal and year-round residents as well as migrants. While one does not normally expect to find wildflowers growing in a desert environment like Arches National Park, they are actually quite bountiful. 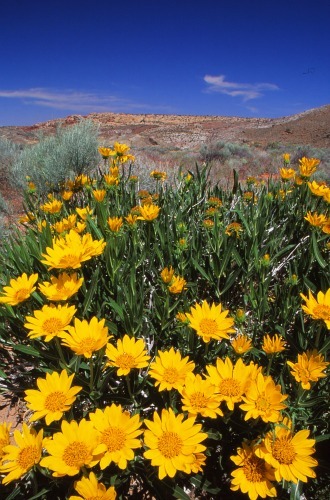 Large plants are a natural part of the high desert ecosystem providing food, shelter and shade for animals and for the prevention of soil erosion. Pets must be on a leash at all times when outside a vehicle. • The exception is at a paid campsite at the Devils Garden Campground as long as they do not cause a disturbance. The town of Moab had its early beginning in April of 1855 with the establishment of a trading fort called “Elk Mountain Mission,” but, after repeated attacks by Ute Indians, the fort was abandoned in September of the same year. It would be another twenty-three years, 1878, before Moab would become a permanent settlement. On December 20, 1902 Moab was incorporated into a town. It has gone through several transitions, from an agricultural based economy, to potash and manganese mining, to becoming the “Uranium Capital of the World” in the 1950s. Today, Moab, a town of almost 6,000 people, has become a popular destination of mountain bikers, four-wheelers, hikers, rockclimbers, photographers, rafters, Highliners and BASE jumpers. If you are planning on staying a few days in Moab, or even a few hours, a good place to start would be with a visit to the website of the Moab Area Travel Council. Here you will find just about anything to do with Moab and the Moab area, from dining and lodging, to local attractions, even to weddings beneath a sandstone arch. 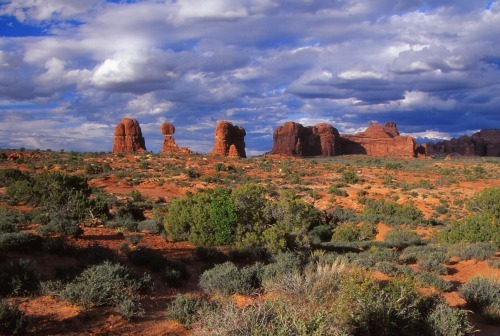 Like much of the southwest, Arches National Park was home to the ancestral Puebloan and later the Fremont people. They were hunters and gatherers who settled in the area and raised maize, squash and beans and lived in pueblos similar to those found at Mesa Verde. The only evidence they left behind of their existence here are rock art panels. Both the Fremont and the ancestral Puebloans left the area about 700 years ago. They were replaced by nomadic Ute and Paiutes. This is evidenced by rock art panels which depicted men on horseback. Horses were introduced to the natives by the Spanish. Spanish explorers were in the area searching for travel routes from Santa Fe, NM to their missions in California. The old Santa Fe Trail passed by what is today the park’s Visitor Center. The earliest known date of a person of European ancestry visiting the park was June 9, 1844. This was an inscription left behind by Denis Julien, a French-American trapper. In the 1850’s Mormon Church of Latter Day Saints tried to establish the Elk Mountain Mission in what is now Moab. This Mission was abandoned due to conflicts with the Utes. Somewhere around 1898, Civil War veteran John Wesley Wolfe, built a homestead, known as the Wolfe Ranch, across from what is today the Delicate Arch trailhead. He and his family lived there for ten years or more before moving back to Ohio. The cabin remains as an artifact to those early years. for creating a national park. Railway executives, interested in bringing more rail passengers to the area, were quick to respond and soon the United States government sent investigative teams to gather evidence. In 1929, President Herbert Hoover signed the legislation creating Arches National Monument. In 1971 Congress changed its status to a National Park. Journalist and environmental activist, Edward Abbey, worked as a seasonal ranger for the National Park Service at Arches National Monument in 1956 and 1957. His first work of non-fiction, Desert Solitaire: A Season in the Wilderness, was based upon notes and sketches from those years. He was best known, however, for The Monkey Wrench Gang which was used as a handbook for radical environmentalist groups. Edward Abbey died on March 14, 1989 at his home in Tucson, Arizona. “Abbey wanted his body transported in the bed of a pickup truck, and wished to be buried as soon as possible. He did not want to be embalmed or placed in a coffin.